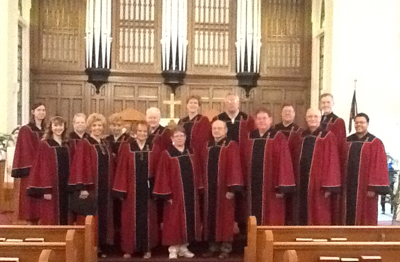 The Sanctuary Choir enhances the worship experience with meaningful music. Directed by our talented organist, this is a group who really enjoys singing! No audition is necessary and new singers are welcomed. Rehearsals are fun too! The Sanctuary Choir and Bell Choir usually perform on alternate Sundays. 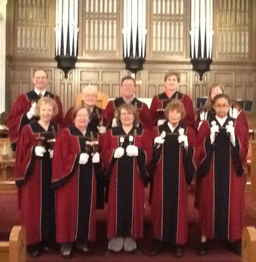 The Bell Choir has two sets of instruments which they use in bringing greater glory to God. 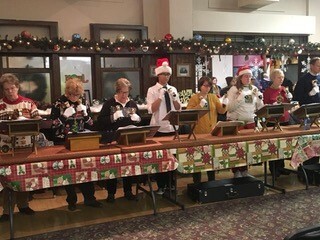 The hand bells have a brighter sound that makes livelier works sparkle while some pieces are better presented with the softer, more mellow voice of the hand chimes. This group also enjoys their rehearsal time and there is usually a need for more ringers, even as substitutes. It is important to be able to read music to perform with this group. Performing a few times a year with only voices, this choir has members from the Sanctuary Choir as well as some who enjoy singing but do not want the regular commitment of the main choir.